It's a chain that is available nationwide making it VERY easy for us to coordinate our groomsmen! The selection is good, but I wish I had more option in the shirt color. The Ivory Shirts looked WAY more yellow in person than it did online. Seeing to that our ties were platinum/silver in color, I'm glad I looked at the shirts first before deciding. They will say that if the shirt is white and the wedding dress is "off white" that it will make your dress look dirty. This is NOT the case and only true in bright, bright store fluoroscent lighting. Believe me when I say that I went through a lot of heartache over this, and we finalized on white shirts for everyone while my dress was off-white/ivory in color. Our pictures turned out GREAT and without any question of whether or not the shirts or dress looked "dirty." We got tux's for Travis, groomsmen, ushers and dads. 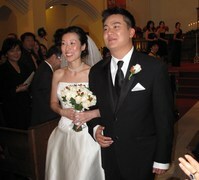 It was easy to order the tux's, easy to manage the group online and everyone looked great and Travis' tux was free. They were helpful and nice to me on the phone. The reason they get 4 stars is because my dad said a woman was very rude to him at the Ridgedale location everytime he went in. My dad is the sweetest man on Earth, so I know he did not do anything to deserve someone being rude to him. The fact that it happened more than once tells me someone there is not doing their job well.